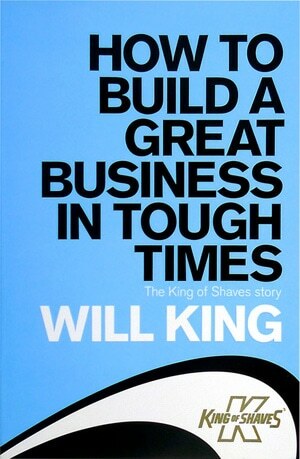 Have to say that this book How To Build a Great Business in Tough Times – The King of Shaves Story by Will King is extremely easy to read, it is a very informative and open account of how the King of Shaves brand was established. I have always been a great believer in serendipity, paying it Forward and self-fulfilling prophecies so I was pleased to find a few coincidences in this book that made me smile as I read them. He mentions that he banks at Barclays (King Street, London), I Bank at Barclays (King Street, South Shields). He also mentions that he stopped wearing watches because he didn’t want to be restricted by them. I stopped wearing watches because in my days of a travelling sales engineer, I felt it sent out the wrong signal to clients if you started to look at your watch during an appointment with them. I have never worn one since. He mentions that money was never really the driving force behind his motivation to succeed. I agree with that wholeheartedly. He comes across as an open and trusting person that seems willing to give people the chance. The Incident with an employee banned from Driving is similar to one I have faced. He is very open about how he has achieved his success to date and doesn’t seem phased about the fact it has probably given competitors an insight into how to replicate his business. I haven’t written a book yet but if I did I would take the same tact. My prime business is a business related to batteries. To continue his animal theme as he describes fighting against 800 lb Gorillas, I would say I was the little bird eating the crumbs that were ignored by the bigger birds. I never worried about the competition all I wanted to do is to build the best company I could build and let the competition worry about me. I believe it is the customer that makes the final choice. There is a theme in the book about spinning plates. I have had a few little plates smash from a great height, fortunately not the big plate. I started to spin another plate about 9 months ago; my new venture: SafetyRazors.co.uk. I didn’t need the additional challenge because running the battery company and building a new factory was a big enough deal, but it was something I had seen 3 years earlier and I felt extremely passionate about it. I had never heard of Will King or his story and I now sit and wonder would I have started down this road. As I said I believe in Serendipity and I guess the answer would have be an even more resounding yes. I have a self–fulfilling prophecy to carry out and if it all fails I will Pay it Forward. I don’t think Mr King will worry too much about all the competitors he has inspired because he will continue to develop his Brand to the best of his ability. The overriding theme of the book is that of encouragement and a call to action. Do something, do anything and don’t procrastinate. I would recommend anyone to read this book, it is highly inspiring and believable. It will be interesting to see and hear how he manages to convey this on the stage, I am looking forward to hearing him tell his story The Kings Speech at Gateshead College next week and I was only kidding I am sure that beards are allowed. Maybe I will write my own book one day. Just need that inspiring title, ideas on the back of a £50 note to the usual address. No Charge… How we Built the Best Battery Company in the UK.